My dog is sick. At thirteen, that’s to be expected. His hearing went two years ago, his mind a couple months today. Doggy dementia. Canine Alzheimer. He formed a bald spot between his hips, started crapping on our carpets and would get lost in the larger of our two bathrooms as if it was Grand Central instead of a generic track home’s shower/tub combo. He still had his appetite though, that was always a constant, the benchmark on which I could count on. So when he refused breakfast last week, I became worried. I’m a worrier, my dog and his vets know this well. I inherited it from my mother, who gave me a whole laundry list of things to be worried about – murderers, thieves, irresponsible drivers, intimacy, paying full price for anything. Growing up and living life on my own added new items to that list – climate change, small children, house fires, the possibility I could live an unsatisfying life, turning into my mother. So, like the worrier I am, I took my dog to the vet. The results came back this morning — spinal arthritis, early kidney failure. Prescription — daily medication, weekly laser therapy, monthly blood tests for monitoring. A fine recipe with no discernible outcome, written on a blank check. We start it all today. My husband is sick. He stayed home from work today, wound up in a six foot blanket log on the couch, periodically shifting and making groaning noises under the comforter I threw over him last night. As I buckle the leash around my dog’s fat brown body, I ask my husband if he needs anything. He shakes his head slightly, pulling a pained expression that could have been exaggerated for effect. “Can I take your car?” I ask. I could, but there wasn’t much gas left so I’d have to fill it up, he tells me. “Don’t care,” he answers with a sneeze. Sure, I could do that. I give him a kiss and hand him our second dog, a white, hyperactive three year old. He had been circling my ankles, eyeing the leash with suspicion, worrying that he would be left out of whatever fantastic adventures awaited outside the door. My husband clamps the white pup between his large arms. The dog squirms, spine contorting in odd angles as he peers at me upside down. His wet black eyes blink at me morosely, a glimmer of betrayal behind them. “Bye guys,” I say before I close the door and leave, dragging my dog, my first dog, my fat, sick, broken dog, behind me. I hear a panicked bark from the living room right as the garage door shuts behind us. I pull into the PetSmart parking lot. This being Reno, the parking lot is pretty empty. We are here looking for dog beds. Since my dog’s spine is bothering him, my vet had told me that an orthopedic mattress would help him sleep more comfortably. So here I am, buying orthopedic dog beds. That sounds expensive, I thought back then. I am, after all, that person. The one who shops for memory foam dog beds without a hint of irony or apology, all just because her dog’s spine is out of sync. He used to get acupuncture too, back when we lived in San Diego. As I poke and prod the various selections available to me, stacked up ceiling high onto metal racks, my dog sniffs around. He occasionally disappears behind a corner, only to scuttle back nervously to my side. An old lady in a red shopping cart, filled with nothing but a pure white poodle groomed to an inch of its life, rolls slowly by. My dog grumbles slightly, making those shuddering growling noises that have become characteristic of his voice since he had major surgery five years ago. Her poodle barks at us, jumping up and down from her seat in the cart. His spherical pockets of fur quiver with indignation. I smile wanly, saying nothing. I commit to a small, snuggly bed that boasts gel memory foam, tall sides, and a claim of being machine washable. I throw it into the front seat and deposit my dog next to it. We head to the vet. Two blocks away, my dog clamors ungracefully into my lap, dragging a trail of light brown fur across my black leggings. His humid, rancid breath breezes across my wrists, the dry air of the car crackling his fur. It feels like old times, when the pair of us would tool around the outskirts of San Francisco, when it’d just be me and him and low hanging electrical wires and bodegas in the outer Mission. Seven apartments, four cities, four jobs, three degrees, two boyfriends, one marriage, and a house ago. Now it’s me and him, once again. Another city, another home, the same car, the same us. I reach up to scratch behind his ears. His pants are loud and uneven, but he’s grinning and doesn’t look to be in pain. Even now, I still don’t know what spots he likes scratched, what parks he enjoys exploring, what positions he prefers to sleep in. As personalities go, he’s not an affectionate dog, he exhibits more cat-like qualities than any dog I know. He hates people outside the immediate family, doesn’t enjoy cuddling and never learned to fetch a ball. He eats, he sleeps, and he bites anyone who dares get into the way of those two, myself included. Groomers were non-starters, vets were basically Satan, and walks were always an exercise in how fast I could disappoint small children who just wanted the privilege of petting him. “He was great,” the vet tech says, smiling. She came around the corner with my dog in her arms, his fat rotund body dwarfing her petite frame. I receive him with a startled expression. “Seriously?” I quickly scan her fingers. No blood. My husband is asleep when I return home. The other dog greets me at the garage door, ball in mouth, abandonment forgiven. As I put away my groceries, I text my middle brother, the one who finds my dog as much a fun novelty as anyone, who would care without judgement. “I just got back from the vet,” I write. I explain how he was feeling, then send a picture of the dog in his new bed. Snug as a bug. By the time all the perishables are in the fridge, I receive a response. I describe the regime the vet prescribed – medication, laser therapy, monitoring. At the last second, I add some flying cash emojis. For levity, probably. “Not much we can do about the dementia though,” I end on a serious note. Typing. Response. ”Twilight of an era,” my brother says. 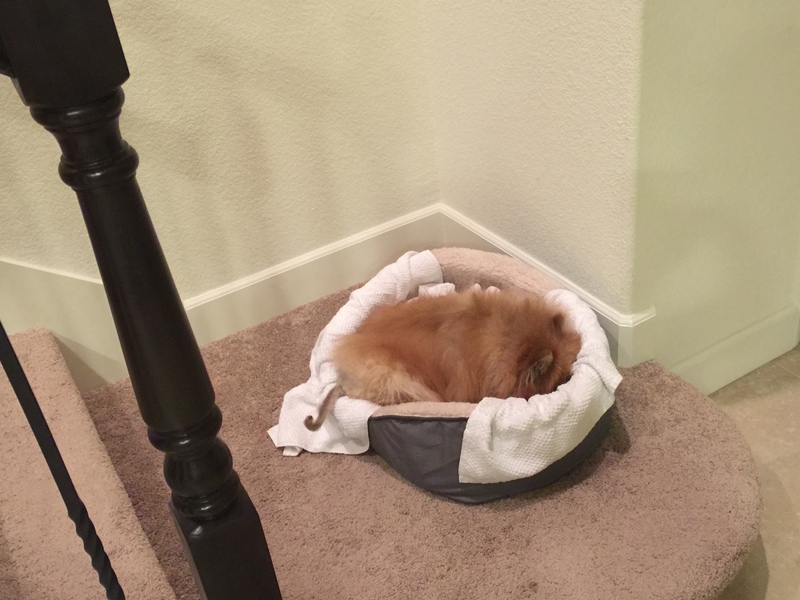 I go to the staircase, where my dog had settled into his new bed, his paws butting up to the sides of his greying cheeks, entire body shoved up to lean into the walls of the snuggler. I sit down on the last step and his snout pokes up, probably catching my scent. “Hey Pon,” I say to his face. Pon smiles at me, mouth agape, tongue lolling off to the side. His broken canines, yellow with tartar, peek out.